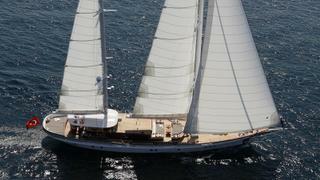 The 35.6 metre sailing yacht In Love has been listed for sale by Vassilis Fotilas at Fraser. Built in cold-moulded epoxied mahogany at Turkish yard Su Marine to a design by Taka Yachts, In Love is RINA classed and was delivered in 2014, and refitted earlier in 2017. An airy and pleasant interior in light wood joinery by Jean-Guy Verges accommodates up to eight guests in four cabins comprising a master suite, VIP suite, double and a twin with Pullman berths. All cabins have entertainment centres and en-suite bathroom facilities, while the master suite also has a television screen. A further three cabins can sleep up to six crewmembers aboard this yacht for sale. A large main-deck saloon comes with comfortable settees in a U-shaped configuration, a dining area with seating for up to eight guests and an entertainment centre including a large screen television and a video system. The emphasis on this popular charter yacht is on outdoor living, with a vast aft deck offering al fresco entertainment and dining. In front of the main saloon, the foredeck has two small tables and an expanse of sunpads, giving guests the perfect space for intimate meals and conversations. Ketch-rigged, she carries a full wardrobe of Doyle sails and is fitted with Bamar furling gear. Under power, a 600hp Scania diesel engine allows a cruising speed of ten knots, topping out at 12 knots. Lying in Turkey, In Love is asking €4,500,000.